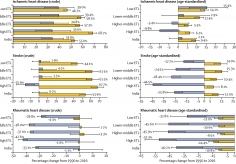 In this report, we present a detailed analysis of how the patterns of cardiovascular diseases and major risk factors have changed across the states of India between 1990 and 2016. The burden from the leading cardiovascular diseases in India – ischemic heart disease and stroke – varies widely between the states. 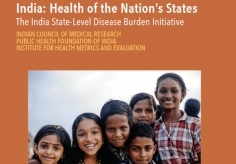 Their increasing prevalence and that of several major risk factors in every part of India, especially the highest increase in the prevalence of ischemic heart disease in the less-developed states, indicates the need for urgent policy and health system response appropriate for the situation in each state. 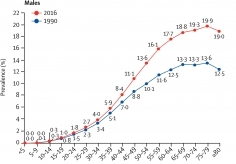 The burden of diabetes is increasing rapidly in India, but a systematic understanding of its distribution and time trends is not available for every state of India. 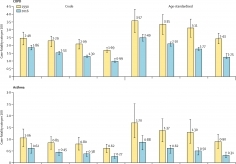 We present a comprehensive analysis of the time trends and heterogeneity in the distribution of diabetes burden across all states of India between 1990 and 2016. The increase in health loss from diabetes since 1990 in India is the highest among major non-communicable diseases. 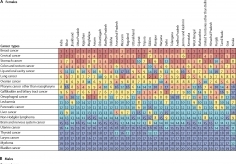 A systematic understanding of suicide mortality trends over time at the subnational level for India’s 1.3 billion people, 18% of the global population, is not readily available. 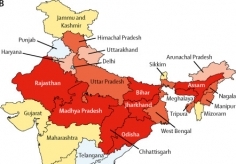 Thus, we aimed to report time trends of suicide deaths, and the heterogeneity in its distribution between the states of India from 1990 to 2016. India’s proportional contribution to global suicide deaths is high and increasing. 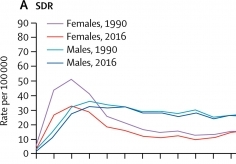 The suicide death rate in India is higher than expected for its Socio-demographic Index level, especially for women, with substantial variations in the magnitude and men-to-women ratio between the states. India must develop a suicide prevention strategy that takes into account these variations in order to address this major public health problem.